The following two versions of my CV will give you some idea of what I have been up to over the years. I have left them in this fairly formal form and in the third person in case you need to use them for submissions or advertising. You are also welcome to just copy and paste, or if you need something else then please let me know. 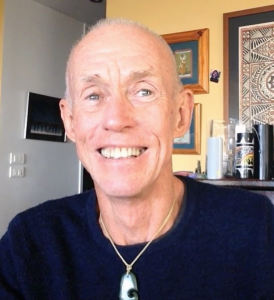 Peter Slattery’s works spans some 30 years, and over this time as a therapist, educator, facilitator and trainer, Peter has worked with adults, with young people and their families and in the community. Originally he worked in Health Services in Australia as a counsellor and youth worker with young people and their families, and for 10 years worked with READY, a project in the south of Sydney addressing damaging drug use amongst young people. He continues to work with young people, particularly those having a hard time of life and works in youth services, rehab centres, schools, or sitting in coffee shops and in parks. But equally he finds himself involved in working with families and whole communities. Peter works both in Australia and overseas and has presented at conferences and run programs throughout Australia, England, Scotland, Denmark, the Netherlands, Hong Kong, Canada and the United States, and more locally has worked in East Timor and extensively throughout Aotearoa New Zealand. Over the years he has had the joy of training and supervising a great number of workers and he has found himself at one time or other in most government departments, universities and other places of education and numerous non-government agencies in the health, youth and community fields, conducting training, supervising workers, chairing forums or facilitating ‘moments of tension’. Peter has produced an enormous number of resources, including his book which is used world-wide: ‘Youthworks. A very practical book about working with young people.’ Most recently he is delighted to have completed a DVD training resource called ‘Conversations with young people’. Peter is constantly in demand as a keynote speaker at conferences throughout Australia and overseas. He says simply that his aim is to be useful, particularly for those having a hard time of life, and to this end he will call on any strategy that might help this process; theatre, physical movement, drawing, ‘challenging’ conversation and just plain foolishness. Peter continues to work extensively throughout Australia and overseas as a direct worker, and as a trainer and speaker. Peter Slattery has worked with individuals, families and communities for 30 years. Resident in Sydney Australia; Peter works throughout his own country as well as in Asia, Europe and North America. Among the many resources he has published is ‘Youth works. A very practical book about working with young people’ which is used both in Australia and overseas, and most recently a DVD called ‘Conversations with young people’. Peter’s passion is to find or develop new, exciting and ever more useful ways of helping people explore what troubles or inspires them. He draws on theatre, storytelling, drawing, humour and indeed anything at all that might help in this process. Please contact Peter to discuss any aspect of his work. Okay, so there are the CV’s. It may also be useful for you to be aware of the areas in which I both conduct direct work and train others. You will find some fuller descriptions of a number of these and other workshops on the ‘Workshops’ page. Group work. Making it sensational! Motivation. What is it really? Adult Education: Is it Really Different from other Education? People and Organisations: Where do you want to work? …Ah I know there is another Peter Slattery, coz I am not the one you think I am. From Perth and never played rugby. Or AFL for that matter. But I suspect your Peter is still out there somewhere…google some more. Best wishes. did you work on script development for a movie named Resistance? in Sydney in the 80s…or was that one of the other Peter Slatterys? Enjoyed your training session yesterday. It was very informative. Appreciate your great energy.